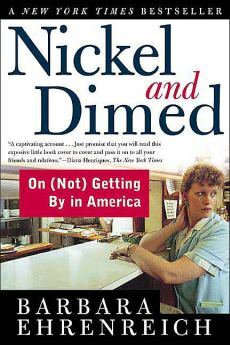 I’d been meaning to read Nickel and Dimed for quite some time, partially because I was interested in the subject matter, and partially because I know so many people who should have been the target audience, but read it and hated it. After all was said and done, I found this book to be immensely informative and an important book for most anyone to read. The basic premise is that the author, Barbara Ehrenreich, lives a comfortable life as a writer / journalist. She realizes that books/studies about the working poor don’t really go far enough to explain the realities of their day to day lives, and so she sets off to live as they live for a few months at a time. She eventually lives in several cities, works at a number of low-wage jobs and shares her experiences. The main issue people seem to have with this book is that though she doesn’t use her education or work history to land the jobs she gets, she still has an incredible amount of privilege. No matter what her job applications say, she is clearly educated, she has been taught money managing skills, and she is articulate. She also knows that this is just an experiment, and at any time she can simply buy a plane ticket back to her comfortable life. It’s true that this isn’t a 100% authentic portrait of what it’s really like to work unskilled labor jobs, or how it feels to wake up every morning and not be sure how you’re going to feed yourself after your 12 hour shift. But the author was very upfront about this, her writing is not congratulatory, as I’d worried, and in fact she gives example after example of the ways her experiment don’t reflect the reality of her co-workers. So no, it’s not perfect, but for what it is it’s interesting and very well-written. It’s more than just a journal of her experience, it’s also chock full of figures and facts that demonstrate how thoroughly she did her research, and how deep the economic and social divides really run in this country. Like I said, this is an important book. I’m glad I read it and I encourage others to do so. This entry was posted in book reviews, non-fiction and tagged book review, ehrenreich, non-fiction. Bookmark the permalink.